These mussels bathed in a garlicky tomato broth are heavenly, and they are also one of the most budget-friendly seafood options available today. This dish makes a delicious first course or light supper. Serve it with crusty French bread for dipping into the broth. Drop them into lightly salted water to cover and let stand for 15 minutes to rid them of sand. Scrub the mussels thoroughly with a stiff brush and remove the fuzzy beards. Discard any mussels with broken or open shells. In a 6-quart pot, melt the oil over medium heat. Add the onion and garlic and cook, stirring often, for 5 minutes, or until softened. Add the tomatoes, broth, and parsley and bring to a boil over high heat. Reduce the heat to low. Add the mussels. Cover and cook for 3 to 5 minutes, or just until the shells open. Gently stir once or twice to ensure even cooking. 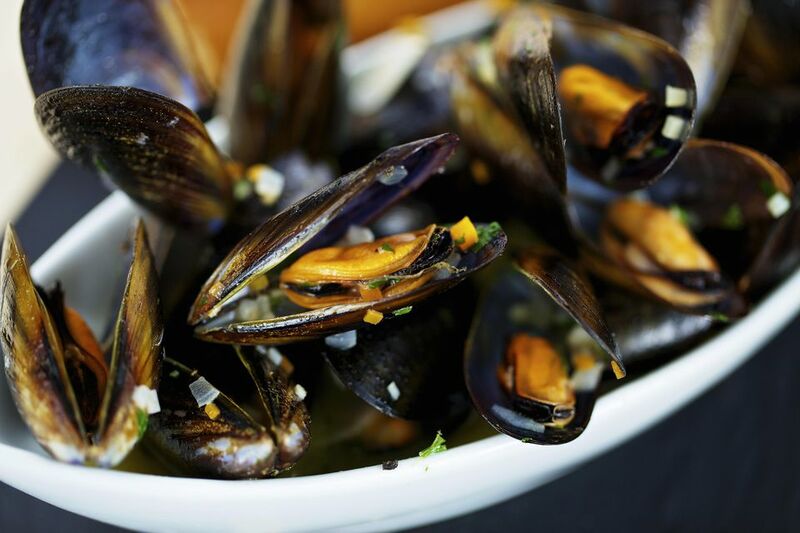 With a slotted spoon, transfer the mussels to individual bowls, discarding any mussels that haven't opened. Ladle some of the broth into each bowl. and serve right away.